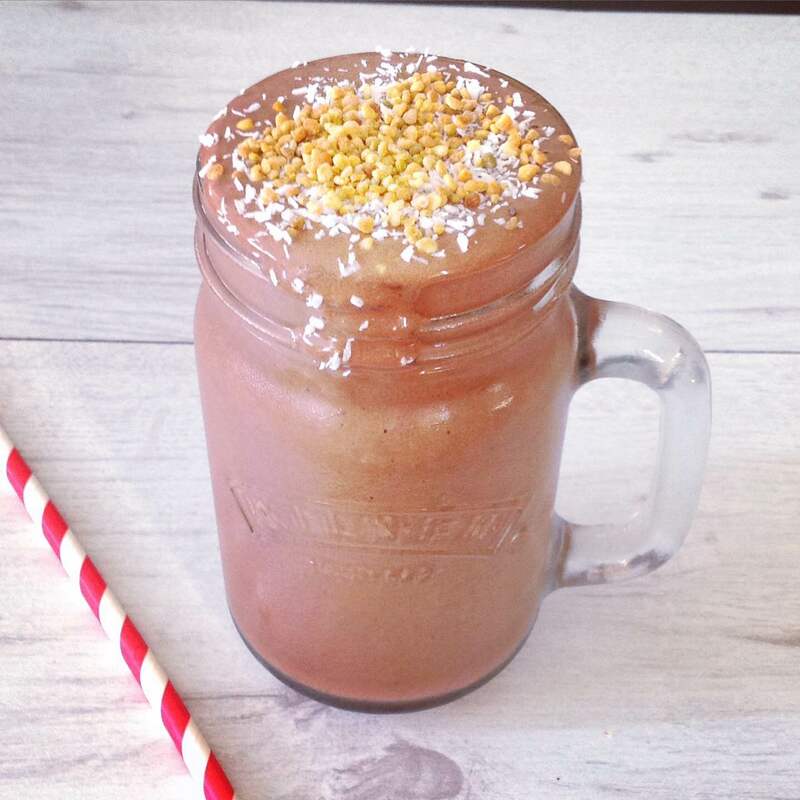 This luxurious extravaganza is my Chocolate & Maca ‘Thickie’ shake…It is one of my favourite ways to start my day. Thick, chocolatey amazingness. Would you believe me if I told you that it was dairy-free and sugar-free? Well you should believe me, because it’s true – and it is made with only 5 ingredients (along with your favourite toppings). This is one of my trialled and tested ways to satisfy sweet cravings AND get a nutritious, on-the-go breakfast. It requires a teeny tiny bit of prep, you must peel, slice and freeze a banana. I mean you CAN use a fresh banana and it won’t be the end of the world. But the frozen banana is where the magic really happens. Adding the banana basically turns a delicious smoothie, into what I like to refer to as a ‘thickie’. It is like this beautiful hybrid creation – half smoothie, half ice cream. Maybe I am a bit obsessed with breakfast for dessert recently – as demonstrated with my Pumpkin Pie Overnight Oats, but this is SUCH a delicious way to start your day. It also makes a great recovery drink after you have exercised. I love topping mine with things like bee pollen, desiccated coconut and freeze-dried fruit powders! So, so good – it will tempt even the hardiest of smoothie-haters. Put all ingredients into a blender. It must be a powerful blender to achieve a smooth consistency! I use my trusty nutribullet. Let the blender do its thing. Decant, carefully into your favourite glass. 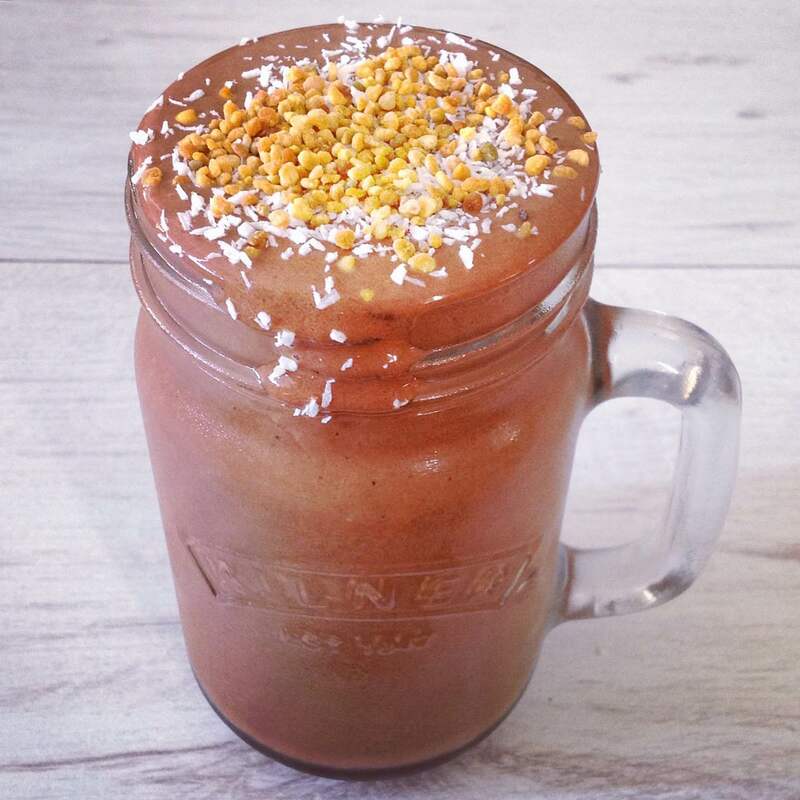 Top with your favourite toppings – I use bee pollen or desiccated coconut normally. Posted on October 30, 2015 January 6, 2016 by TinaManahaiPosted in Recipe, smoothieTagged banana, breakfast, cacao, chocolate, exercise, fruit, Healthy, nutribullet, raw, recovery, smoothie, smoothies, superfood.